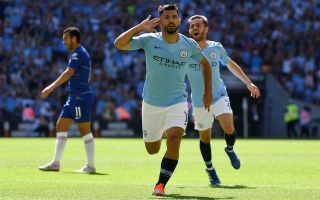 Man City ran out 2-0 winners over Chelsea in their Community Shield clash at Wembley on Sunday, with Sergio Aguero’s brace sealing the victory. Both sides enjoyed spells of possession early on, but it was the reigning Premier League champions who had the clinical edge in the final third courtesy of their Argentine talisman. After a fine team move which ended with youngster Phil Foden providing an assist for Aguero, the 30-year-old made no mistake as he was given too much space by the Chelsea backline to allow him to find the back of the net. Although he did miss a great chance to double his tally in the second half, he wasted little time in making up for it as he latched onto Bernardo Silva’s pass and grabbed his second of the game with a top-class finish to beat compatriot Willy Caballero. Unsurprisingly, having emerged as the match-winner, Aguero gets our Man of the Match award, while Foden, Silva and John Stones all impressed. It was a different story for Chelsea though, albeit they still need time under Maurizio Sarri to adapt to his demands and style having only arrived to replace Antonio Conte last month. There were positive signs from the Blues in pre-season, but with the intensity stepping up against a side very familiar with one another, it was always going to be a difficult task against Pep Guardiola’s men. With City able to constantly break between the lines and dominate the midfield battle, the likes of Cesc Fabregas and Jorginho struggled leaving the defence exposed, with most of the back four scoring 5/10 with us due to their inability to keep things tight. Meanwhile, attacking stars such as Pedro and Alvaro Morata weren’t able to offer enough of a threat, although youngster Callum Hudson-Odoi did impress in spells given he is looking to make an impact ahead of the new campaign. Nevertheless, City were deserved winners as they look in ominous early form. Chelsea player ratings: Caballero 6; Azpilicueta 6, Rudiger 5, Luiz 5, Alonso 5; Fabregas 5, Jorginho 6, Barkley 5; Pedro 5, Morata 5, Hudson-Odoi 6. Substitutes: Willian 5, Drinkwater 4, Abraham 5, Moses 5. Man City player ratings: Bravo 5; Walker 6, Stones 7, Laporte 6, Mendy 7; Fernandinho 7, Mahrez 5, Foden 7, B Silva 8, Sane 6; Aguero 9. Substitutes: Gundogan 6, Jesus 6, Diaz 5, Kompany N/A.